I thought I would show something other than Yipes! Stripes!! Hopefully I have not burned you out on my obsession love of black and white stripes, however, if I have, you will be glad to know I am now going to talk about checks!! I think some of the reasons I love checks are that they feel fresh and crisp. I love their uniformity and the way they make a room feel as if it has order but are still fun. I have a collection of checked images that I would love to show you…….. I not only get some of my favorite pattern but it is also in one of my favorite combination of colors. Beautiful blue and white, always a classic. Love the oversized scale of this check. It is often referred to as Buffalo check. What an amazing collection of brown transfer ware. A smaller check is used on these chairs and a wonderful brass nail head trim is added. I really like the contrast of the gold and black. More blue and white. This time in a buffalo check. Love the chandelier in this room. If this were my room I would paint the walls crisp white and the inside of the shelves in a crisp apple green. I love the fresh look of blue and green together. Black and neutrals always make a good choice. Fun table for all of you bloggers that love the burlap, rope look. It looks like a giant spool of thread!! How fun is that?! A simple , neutral check gives these wicker chairs a fresh and casual look. This looks as if it is a home by the ocean. Notice the hanging lantern and the reflection of the ships wheel in the mirror. Check out the chandelier. It has an anchor in the center which is very clever!! Love this room with it’s mixture of stripe and checks. I also like the mix of formal and casual. Understated elegance, just my style preference. Love these two checked settee's!! What is a rather formal lined piece has become more approachable with the informality of the black and white checks. The room becomes much less serious. We not only have checks but checkerboard patterns in this room. This is obviously a very Country styled room, but very cute. Checks and toile always make a nice combination. As you can see, checks can be used in so many types of rooms. It can be used in a more formal setting . Checks can be placed on antique pieces to freshen their look and make them more approachable. So how do you feel about checks? Could you see yourself using them in a room? What size and color would your checks be? I will leave you with a few pictures of the checks/checkerboard patterns I have used in my home. 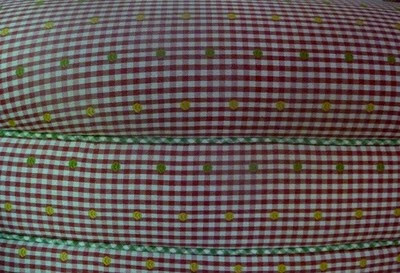 Here is the very tradtional linen fabric that is on my sofa. You know how I love a little whimsy so I added a cord welting in a watermelon/pink check. Once I made that choice the rather traditional flavor of the fabric became more ME! 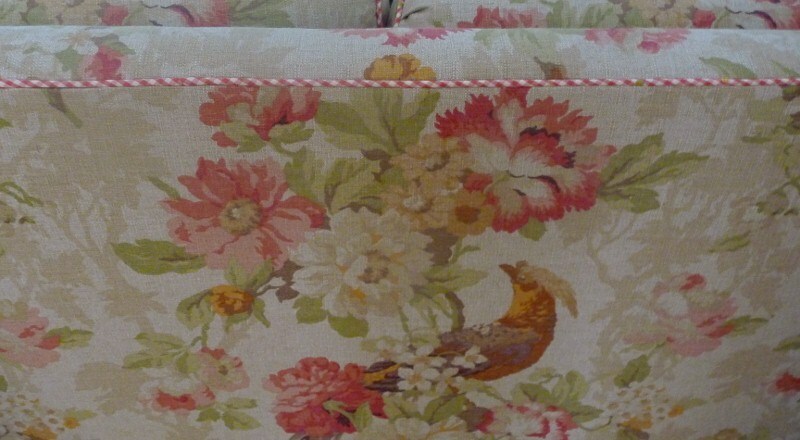 This is the same fabric that is on the sofa cord welting . I used this on a reading chair in the corner of my family room. I love a contrasting welt so I chose a Springy green to go with the chair. My sofa is Hickory White and my chair is a Highland House with a Century cord welting. 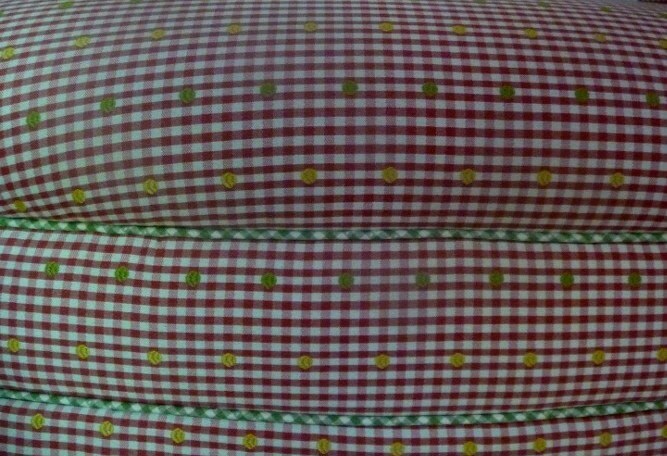 Since I did different fabrics from different manufacture's it was considered a COM( customers own material) . You can add different fabrics to your furniture pieces if they are a custom order. Just realize it does take longer to get the fabrics approved and shipped to the manufacture of the furniture piece. These pieces took 4months which is pretty normal for a nicely made custom piece. I hope you have enjoyed playing checkmate with me today! “Enjoy the Process” Of: Adding checks to your room.